The ancient market town of Bampton (also called Bampton-in-the-Bush) lies in the south of the Cotswolds in the county of Oxfordshire, not far from the River Thames. Until about 1850 it stood in the centre of a large area of common land, hence its previous name of 'Bampton in the Bush'. Bampton is sometimes described as a town, because it used to be a market town until the 19th century. It is now officially designated a village but has both a Town Hall and a Village Hall. The little market town of Bampton is located in the Thames Valley 4.5 miles south west of Witney and 6 miles from the well known Cotswold market town of Burford. The town has many pleasant 17th and 18th century houses, a few inns and a minute early 19th century Italianate Town Hall. Bampton is one of the oldest towns in England. Nearest Visitor Information Centre is at Burford or Witney. There is a Visitor Information Point in the entrance to Bampton Post Office with leaflets and information about what to see and do in the area. US troops were billeted in Bampton at various times during the Second World War. Parking - Free parking around the town hall in the centre of the town. 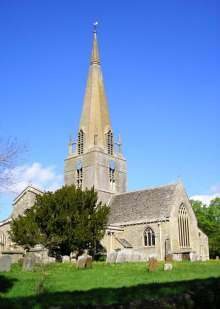 At the time of the Norman Conquest, Bampton was one of the three largest settlements in the county. It had an important salt works and an early market. The town enjoyed amazing prosperity in the early Middle ages, and much of its wealth was based on wool. In 1255 a second market and annual fair were granted to the town. Bampton has for generations been renowned for its Morris Dancing traditions which are still celebrated today. Look out for the West Ox Arts Gallery upstairs in the Town Hall, with a rolling programme of exhibitions of various art forms. Downton Abbey is a British period drama television series created by Julian Fellowes and co-produced by Carnival Films and Masterpiece. It first aired on ITV in the United Kingdom on 26 September 2010 and on PBS in the United States on 9 January 2011. Highclere Castle in Hampshire was used for exterior shots of Downton Abbey and most of the interior filming. The servants' quarters and working areas and several of the "upstairs" bedrooms were constructed and filmed at Ealing Studios. The village of Bampton was used for filming outdoor scenes, most notably St. Mary's Church and the library, which serves as the entrance to the cottage hospital. For more see - Cotswold film locations. The Church of England parish church of Saint Mary the Virgin dates from the 12th century. It was built on the site of a late Anglo-Saxon Minster - the tower of that minster survives within the present church. It has a 13th-century spire and carved stone reredos of Christ and the apostles from around 1400. The church of St. Mary the Virgin is of immense interest , with a splendid 170ft spire at the base of which are four flying buttresses, each surmounted by a carved apostle. The contents of the interior include canopied sedilia in the chancel, a fine stone reredos, three brasses and an impressive 17th century monument to George Tompson (1603) in the south trancept. Thompson was a wealthy yeoman of Bampton and left money in his will to the poor. Throughout its history the church has been rebuilt and extended many times, most recently in 1870 when the roof took on its present form. Also of interest in the town is the delightgul Old Grammar School in Church Street, now used as a library, and the gatehouse of Ham Court in Mill Street, a building once forming part of Bampton Castle, which had been built by the Earl of Pembroke in the 14th century. There is a pleasant walk south-west from Bampton, via the hamlet of Weald, to the Old Man's Bridge and Radcot Lock, both on the Upper Thames and joining the Thames Path. Aston Pottery, West Ox Arts Gallery. Aunt Sally is a traditional throwing game, played predominantly in pubs in Oxfordshire. The Bampton & District Aunt Sally Association was formed in 1971. In the Bampton league, games are played on Thursday evenings between teams of 6 players (unlike other leagues in Oxfordshire who field teams of 8).